Britain's version of the Oscars®, the BAFTAs swept through London this past weekend collecting all Tinseltown's glitteri up in its wake. 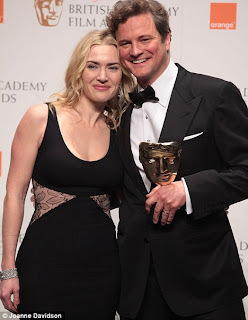 I hope Hollywood took note at the eclectic assortment of BAFTA winners. Sure, 'Avatar' may have raked in the most cash but a plethora of greenbacks does not mean a movie has the most heart or best performances. James Cameron's blue-hued epic won just two awards -- neither of which were for Director, Best Picture (both went to 'The Hurt Locker' -- with Cameron's ex, Kathryn Bigelow at the helm), or for acting (thank goodness!). Nope, the BAFTAs did the right thing and granted their lead actor trophies to the lovely Carey Mulligan ('An Education') and the humble Colin Firth ('A Single Man'). At least one motion picture academy set the right tone. Will Hollywood follow suit? I'm not holding my breath! Watched the BAFTA''s this morning (TIVO'd them last night b/c I was watching the hockey game) & was also VERY pleased to see others - anyone really - win over Cameron & Avatar. I thought all the right movies & actors were recognized (didn't see all the movies obviously but what I saw I liked) & Redgrave's speech was charming & sincere. If only Hollywood took notes. I want to see "A Single Guy" but haven't had a chance.